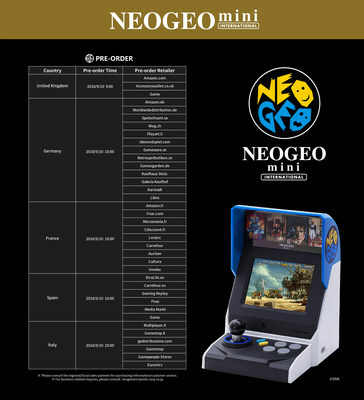 NEOGEO mini accessories including gamepads (both white and black colors), stickers, and HDMI cable (for TV use) will be also open for pre-order via local distribution channels. The NEOGEO mini is a game console including 40 of SNK's greatest game titles. All the titles are selected from the "NEOGEO" game platform from the 1990s. The console has a 3.5-inch LCD display so it can be played without connecting to a TV screen. Players can enjoy classic NEOGEO titles on the NEOGEO mini.